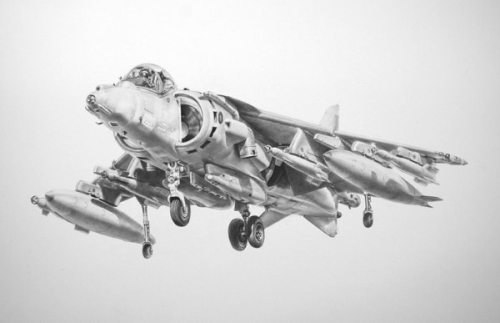 The Harrier was a unique aircraft insomuch that it was a Vertical or Short Take Off and Landing (VSTOL) aircraft designed during the Cold War. It was a triumph of British innovation, design and engineering. Back then and in the event of war, the Harrier would operate close to the front line from autobahnn strips or clearings in forests. Fortunately this was not to be. The Harrier saw action during the Falklands War, the Kosovo and Afghanistan campaigns and were flown by crews of the RAF and the Fleet Air Arm. The GR9 was a different aircraft from the original GR3 in terms of avionics and upgraded engines. The Harrier was contraversionally removed from service by the Conservative and Liberal coalition government in the defence cuts of 2011. The few Harriers in service at that time could not sustain operations in Afghanistan; were unable to carry the air-launched cruise missile, Stormshadow; nor conduct stand-off reconnaissance like the Tornado with the RAPTOR pod. The government also cut two Tornado squadrons (13 & 14) from the RAF. The removal from service of Harrier caused a furore within the ex-Harrier pilot fraternity as this threatened the future of the fixed-wing element of the Fleet Air Arm, until the introduction of the F35 Joint Strike Fighter. Meanwhile the Royal Navy would be without a fixed wing aircraft and aircraft carriers as they await the building of two vastly expensive carriers.